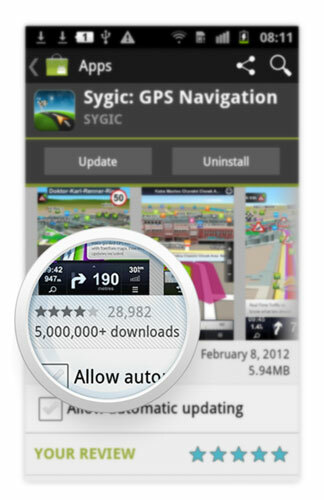 Sygic have announced that over the last weekend they reached a massive milestone - 5 million downloads from the Android Market within a single year! Skobbler have just announced that they are ceasing development of their app on the Android platform but it doesn't seem like Sygic are planning on leaving any time soon. We have, for a long time, had a good relationship with Sygic (as you can probably see from the number of apps they have offered as prizes) and we wish them all the best for the coming months and years. For me, Co-Pilot is the Android navigation system of choice. More basic but solid reliability compared to the others. And none quite match a PND. Yet. I have been Looking at the iPhone and iPad from the same company. NOT GOOD there are a lot of bad reviews and complaints about there help and support service. extras will cost you extra per a year. so not looking good if you have a iPhone or iPad. Agree woith most comments...still a bit flacky on the routing...cannot be relied upon with 100% accurancy....and how do you do an 'alternative' route while driving (as I know the way it is suggesting to be toatlly out of the way) ? Am I the only one to think that the reviews on both iphone app store and Android Market are often very poor. It seems to me that most modern smartphones are simply too smart for some (many) users, and you get the most stupid rubbish written about them. It must be really frustrating for the app's developers, when what they are complaining about is due to their own stupidity. And then there is the "I don't want to pay for an app" brigade, who conveniently forget just how much they paid (or are paying) for their device. So they download Sygic (which clearly states it is time limited demo only and you will need to pay for maps) and then give it one star when they are asked to pay. The "everything should be free (except for my stuff)" hypocrites. Don't believe me? Just look at some of the rubbish written about CamerAlert. I have to agree that sygic support is useless, I actually likes the software that I have and paid sygic for the latest maps. Only thing is I need an activation code Ipaid over a week ago and opened a ticket also my requests have been ignored. Maps on the fee version are time limited (or at least navigation with them is). Once you have bought the maps they have free updates for life, but the maps are not free. Please can we have downloads of speed cams and POIs in RUPI format, instead of always having to go through the converter? This makes me dread updating my POIs, when it should be a straightforward procedure. Samsung Galaxy Note 9, Nexus 5, Galaxy tab S3. Also use OSMAnd+, Sygic Mobile Maps, and OS maps app. Also "Great Britain Topo Maps" and "Old Maps". Don't use speed camera database as sticking to the limit is safer.